There are numerous types of massage machines starting from affordable handheld massagers up to full body massage chairs. Any of these massagers will help you relax, energize or reduce stress. The following are the best in my opinion and can make you feel like you just had to treat yourself to a luxurious spa day. Many women complain about sore feet after a long day at work. 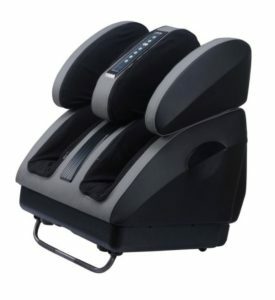 The perfect way to get rid of that feeling is to use the a quality foot massager that fits your needs. It gives your feet that sort of feel that you are getting a deep kneading Shiatsu massage. The secret is that these massagers have rollers that provide a rolling kneading massage to your lower extremities. After turning it on, you might want to put some pillows behind it so the feet will perfectly sit on top of the massager while you’re comfortably lounging on a chair. The ‘boot type’ foot and calf massager, as the name implies, simultaneously gives a vibrating and rolling/kneading treatment to these areas of your legs. The massager has raised areas that target the pressure points of your feet. The only issue I have with this type of massager is that it might not be too comfortable to use for people with big calves because they might have a hard time trying to fit their legs on the massager. It is also relatively heavy. But overall, it works best with achy legs! Another type of massager worth mentioning is the massaging foot spas. For those of us on our feet all day for work, it’s important to unwind and reenergize before getting back to it again the next day. Of the many ways to do this, getting a foot massage is one way many people would like to do often, but can’t. Spa treatments are expensive, and they take time. Going to the spa is not a luxury everybody can afford. The solution is to bring the spa to you! Foot spa massagers can be a delightful experience to come home to after a long day and an excellent addition to any home. Being able to have the contentment that spa visits leave you with all in the comfort of your home can change everything. Relieving soreness is also essential for you to be able to give your all at work the next day. Foot spas can give you massages involving acupressure and shiatsu just like one at the spa would feel. While your feet are soaking, they will also experience heat and hydrotherapy techniques to relieve soreness. Water temperature can be as high or low as you want and your massage can be customized as well. Massage cushions with heat are perfect in targeting broader areas of your middle and upper back. After using a massage cushion, I felt like I just got out from a complete back treatment at a spa. It is pretty flexible to use because you can either put it on a chair and just sit straight on it so your neck reaches the neck massager or you can put this on a reclining chair for a more aggressive massage. Or you also have the option of doing the neck and back massage at the same time or separately. Either way works fine, in my opinion. If you are prone to suffering from a stiff neck after waking up or being on a computer for so long, you will find a neck massager to be really useful. Usually, neck massagers have rotating balls covered with cloth, so they don’t cause your skin to feel too hot (even when the heat is on) after using them. The design allows you to put the device around your neck. It is pretty simple to use. You can pull the edges of the massager closer to your neck if you want a deep kneading or just simply let it rest on your shoulders if you want a lighter massage. If you are still using the old hand massagers, you might want to try switching to this one. Massage pillows with heat are perfect to have if you do not have the time to go to a spa. These pillows are very stylish and always come in handy. To some, the massage pillow may appear too big, but I never thought it to be bulky because it sits comfortably in all areas I use it to (even on my glutes). After you press the button, it will start to work its magic and have its rotating heads add pressure to your muscles to release tension. It also gives off heat to soothe aching areas especially the back area! 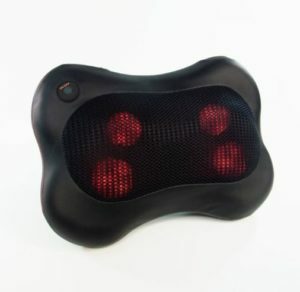 That combination of pressure from the rotating heads and heat makes it a perfect massager to get rid of back pain. My back felt really nice and relaxed after I used it.